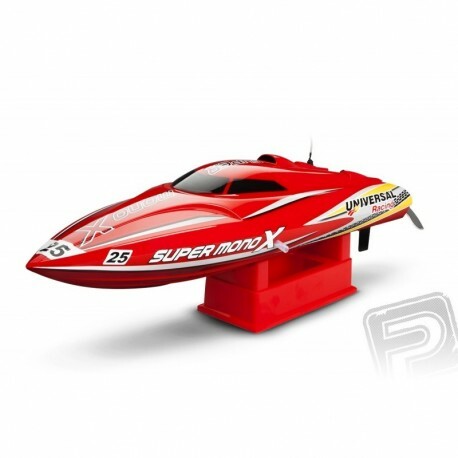 Ship model with plastic hull (420 mm) supplied with AC water cooled engine, water cooled 30A controller, servo and dual channel 2.4GHz RC kit. Small electric speedboat with a 420 mm plastic hull for pleasurable recreational rides on small and larger water areas. Max. 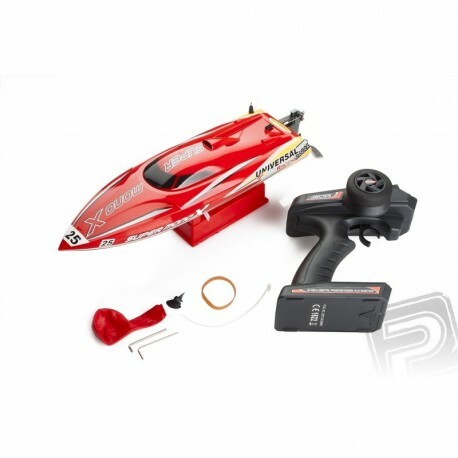 model speed of 45+ km / h.
The model is delivered ready to go (just charge and insert the battery packs - not included) with an alternating motor with a rotating jacket with water cooling. Cooling water is sucked through the nozzle at the rear of the ship, out of the ship, it is drawn to the left front of the hull. The engine power is transmitted by a fixed clutch to the ship shaft with half-mounted two-blade screw. There is a flood chamber on the port, which ensures that the ship returns to its normal position, even if it is overturned or underwater. Direction of driving is controlled by a service which controls the effective rudder. The two-channel pistol 2.4 HGz transmitter controls the on-board electronics with a four-channel receiver, a water-resistant AC speed controller with water cooling and a waterproof 9-gauge servo helmet. 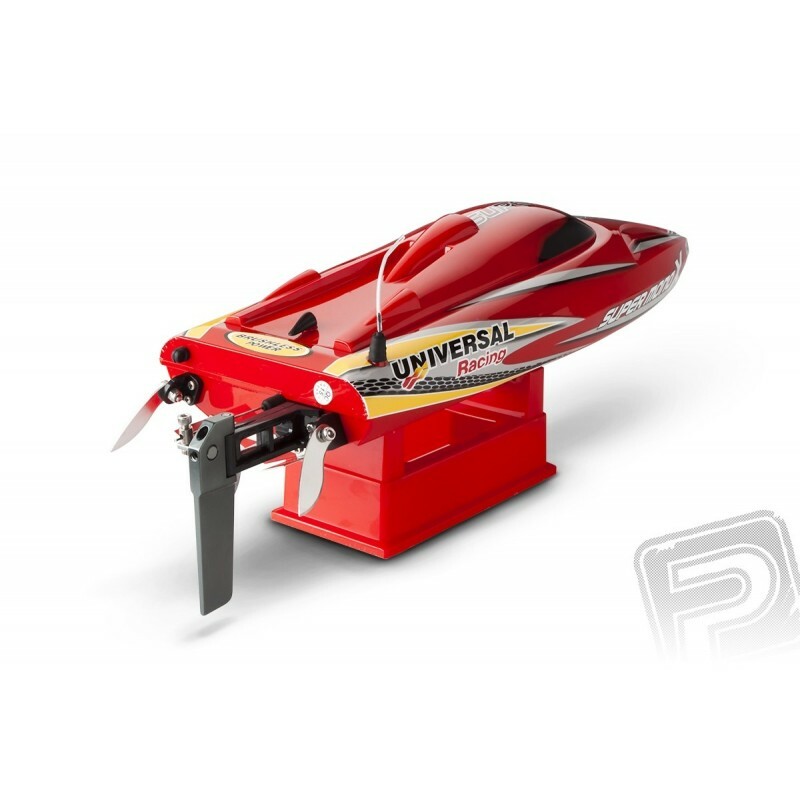 The control of the rudder and engine speed is fully proportional. Access to the engine, accumulators and electronics is provided by a top removal cap that is protected against water ingress by a black seal. The model needs to buy 4 AA batteries for powering the transmitter and the battery and charger. 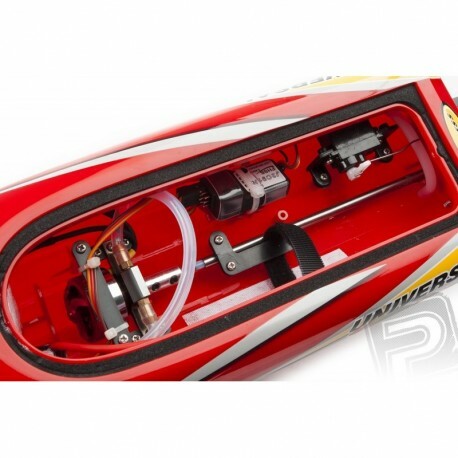 We recommend a 1800 mAh Li-Pol 3-cell battery. Li-poly FOXY 3rd generation battery pack (version 2018) with increased 40 / 80C capacity, charging up to 2C. 3s1p 11.1V 1800 mAh 3-cell, dimensions: 90x30x25mm, weight: 155g, service connector JST-EH.